Firstly, we advise confirming that you can upload the Elucidat .zip file to your LMS. If you are not familiar with how to publish an Elucidat course in order to test this, see here. If you are using our Backup release mode, please also try and doing this with a large file to confirm your LMS can process larger uploads (you can achieve this quickly by making Projects with videos in). We advise confirming that assets (e.g images, video, audio, fonts, symbols) display as you require after uploading to your LMS. We advise confirming that your course is Completing/Passing when expected and passing the score to your LMS if applicable. See here for more advice on the expected scoring and progress behaviour for an Elucidat module. We advise confirming that your content is visually correct e.g the content can be scrolled correct, that all elements are displaying as expected. We advise confirming that information is being logged by your LMS. We advise confirming that Bookmarking is working when you close and re-open the course (if using our 'SCORM for learning management' release mode). For more information on bookmarking please see here. 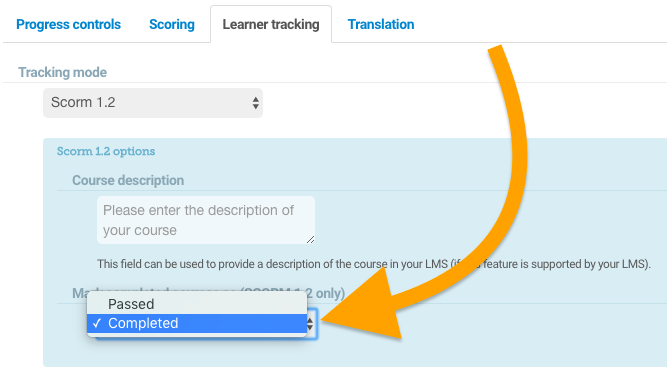 We advise confirming that your learners are displaying correctly in the Your data feature (if this feature is important to you and using our 'SCORM for learning management' release mode). We advise confirming that the user is able to progress as required through the course and that all links and page settings have been configured correctly. Please see here for more advice on how linking works. We advise confirming that your content displays correctly on mobile, here are our top tips for designing for mobile. If you would like more help and advice with reviewing your content, please see this Masterclass course.